Staff and pupils from our Lourdes Group gave up their Saturday (29th October) to raise further funds for their upcoming pilgrimage. 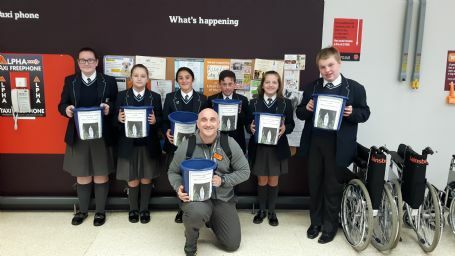 In addition to the £877.29 initially raised by bag packing at Sainsburys Rice Lane on 1st October (original story below), pupils were able to raise a further £440.40 on Saturday by repeating the exercise at B&M Switch Island. This now brings the total raised so far to £1317.69! Well done to all the pupils who participated in the two bag packing fundraisers. Thank you to Mr Bennett, Mrs Triggs, Mrs Jones and Fr Jakub for running the event, and thank you to all the parents who turned up to support the event. 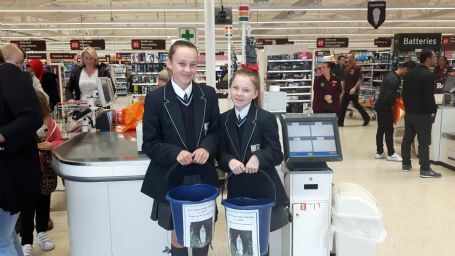 This weekend, 30 pupils, 2 staff and 15 parents participated in a nine-hour shift of bag packing at Sainsbury’s Supermarket on Rice Lane, Walton, in order to support the Colleges bi-yearly pilgrimage to Lourdes. The team excelled in their duties and won the praise of the staff and customers of the store, with one parent getting in touch to say the pupils were a credit to the school. Click the image above to view the Photo Gallery from the event. Although a gruelling task, the team were full of smiles and joy as they worked cheerfully and happily throughout the day. Many customers asked the team to pray for loved ones and shared tales of their own pilgrimages to Lourdes. In total, our pupils were able to raise an outstanding £877.29 to contribute towards their pilgrimage. We would like to thank Sainsbury’s Walton for giving us the opportunity to spend the day in store to fundraise. Please check back to the website regularly for more updates on our fundraising efforts.